Photographic Polar Sunset sequence, introducing "the line"
A digital camera was used, visual observations were always better, digital captures were not exactly similar. 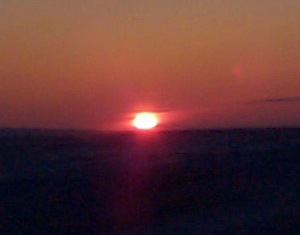 During April 4, 2001 sunset in Resolute Bay, the sun goes down quite fast until it reaches a certain point of stagnation, its descent slows down, at this breaking point the sun appears to stop. 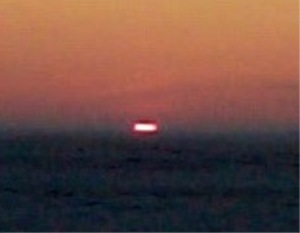 Normal sun, appears round or ellipsoid, it may be about 2 degrees above the horizon. Usually light yellow in appearance. Semi-distorted sphere, refraction of the lower limb begins to exceed upper part of sun disk. The sun appears to have a flat bottom, upper edges form small "squares" at left and right sides. Colours of this sun vary, lower part may be orange upper section white or light yellow. 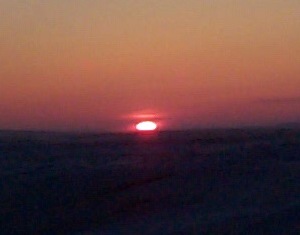 This happens from 2 to 0.5 degrees above the horizon. More a rectangle than a spheroid, refraction of the lower part reduces all appearance that the sun is round at the upper part. Space is compressed by much greater refraction values at the lower limb than the upper. 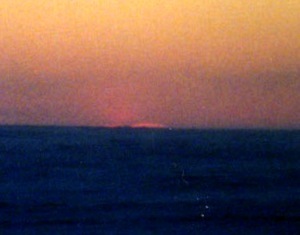 The rectangle appears just above the horizon, and becomes smaller in height as the sun goes down. Rectangular sun was usually light orange. 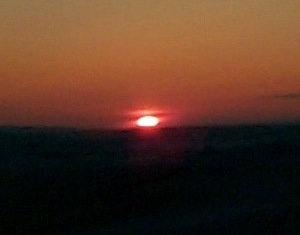 April 4 2111 local time picture portrays the full sun well above the horizon at "official " sunset time. Mathematically provable, the sun becomes very close to a horizontal line. Refraction of the lower limb exceeds the sun diameter and the sun's upper limb refraction boost. Becoming now exceedingly thin makes the line appear jagged, the same as stars twinkling due to turbulence in the atmosphere. The line appears orange to red. Just above the horizon the line is a manifestation of extreme space compression. 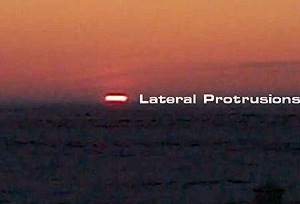 The entire sun appears flattened, in the 2118 local time picture lateral protrusions of the suns thinnest sides proves a total compression of the sun disk. Lateral lobes on each side should be the left and right extreme sides compressed down with different refraction values, again the lower part refracts more than the upper. Phase 6: "Fire on the ice", the sphere reappears. March 2001 35 mm scan "fire on the ice", note the return of what appears to be a red sphere. 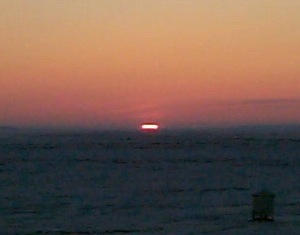 The sun, appearing as a horizontal line, sinks below the horizon, giving the impression that there is "fire on the ice". At this stage it is possible that refraction of sun's lower limb is so huge that the lower limb is now seen, in other words, the line becomes a semi-sphere again with the lower limb protruding upwards. "Fire on the ice" appears to shrink laterally, as the lower limb image struggles against the inevitable downwards progression of the sun. 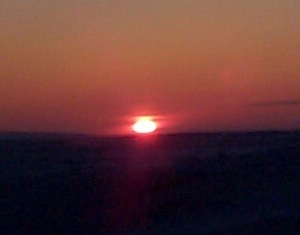 Fire on the ice last stages gives the impression that the sun is round again. This phase is strictly red. 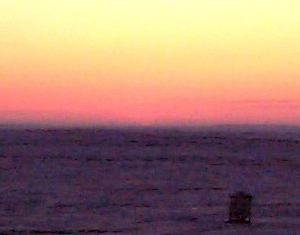 This picture failed to present it well, "fire on the ice" disappeared behind a distant land ridge. Upper limb: extreme edge of the sun disk upper rim. Lower limb: extreme edge of the sun's lower rim.